The sarus crane is the world's tallest flying bird. 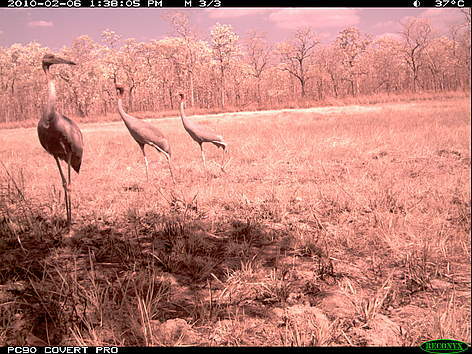 The sarus crane is the tallest flying bird in the world with some individuals reaching up to 1.80 metres tall. The Indochinese subspecies has declined dramatically, and less than 1 000 birds are now confined to Cambodia, extreme southern Laos, southern Vietnam, and Myanmar. While education and awareness campaigns together with stronger law enforcement in key sites seem to have lowered threats in breeding areas, these magnificent birds continue to be threatened by habitat loss and collection of eggs, chicks and adults for food and trade. 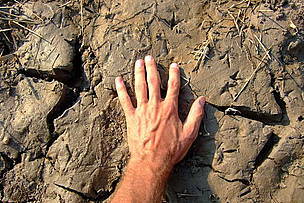 Sarus crane footsteps are larger than a grown man's hand, as shown by this photograph from a trapeang (watering hole) in Mondulkiri Protected Forest, northeastern Cambodia.